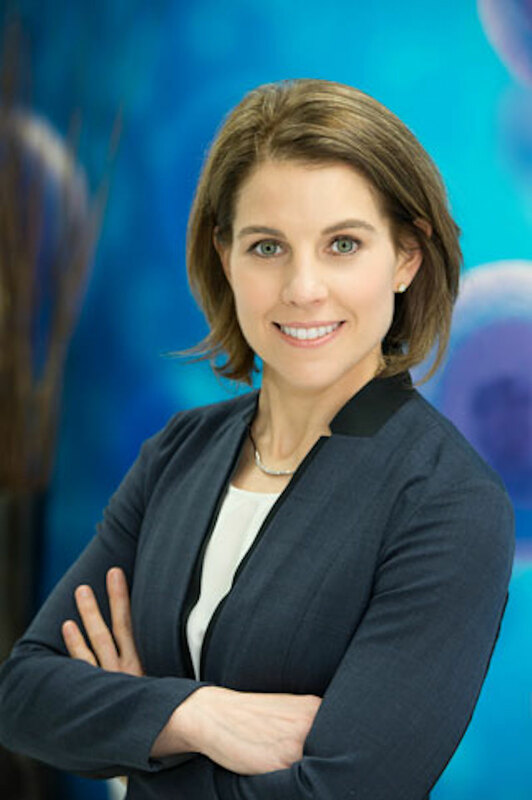 This month we are highlighting the achievements of one of our graduates, Kristin Comella, Ph.D.
Dr. Comella is a world-renowned expert on regenerative medicine with a focus on adipose (fat) derived stem cells. Terrapin, the organizer of the Annual World Stem Cells & Regenerative Medicine Congress, commissioned a global survey of the international stem cell community to create a who’s-who of those significantly influencing the progress of the global stem cell industry. She was named number 24 on Terrapin’s list of the Top 50 Global Stem Cell Influencers. Dr. Comella was also voted number 1 on the Academy of Regenerative Practices list of Top 10 Stem Cell Innovators. Most recently, Dr. Comella made the list of Top 50 Functional and Integrative Medical Doctors/Scientists in the country by DrAxe.com, one of the most visited natural health websites in the world. She has more than a dozen peer-reviewed publications indexed on Pubmed in the field of regenerative medicine. Through Dr. Comella’s leadership, she and her team have trained and certified more than 700 physicians worldwide in adult stem cell therapy. Patient therapy using the patient’s own stem cells (adult stem cell therapy) is not favored in America and powerful forces in the US government, namely the FDA, as well as in America’s big and famous institutions and medical centers have opposed adult stem cell therapy for 20 years. This includes certain of the media, the scientific journals, Big Pharma, our country’s leaders (FDA Directors always come from Big Pharma or aligned medical institutions like Stanford, Harvard, UCLA, USC) and the like even including the National Institutes of Health. Which is why the US is last in the world. The motive in opposing adult stem cell therapy seems to be that the big institutions want to keep federal funding of embryonic stem cell research at a high level with the promise that cures are “just around the corner” despite the fact that embryonic stem cells will never be useful in any way for patient treatment because they immediately cause tumors when transplanted. But many many big buildings have been built with government money to research “stem cells”, yet seeming to study only their lab created embryonic stem cell lines in the fervent hope that someday Something will be patentable to the great benefit of these same institutions. Use the government to fund everything for free, then keep all the profits for themselves. Big Pharma, the major pharmaceutical houses, do not seemingly want to see advances in adult stem cell therapy either because that means a reduction in their sales as patients use their own repair stem cells to control many diseases rather than pills. Plus, adult stem cells in your own body cannot be patented like an embryonic stem cell can be. The idea of patient-specific adult stem cell therapy using the patient’s own stem cells is abhorrent to many people in power. The pharmaceutical houses just haven’t caught on to the fact of the potential of megaprofits available to them in supporting adult stem cell therapy- the need for sterile kits, solutions, sterile growth media, centrifugation equipment, counting and labelling kits, not to mention what they could be marketing in the way of stem cell activating factors, growth factors, individual expansion units for physicians– it is a BIG market. If the motive mentioned above cannot be proven in fact, it certainly can be demonstrated by the result. There is no stem cell therapy being generally used today in the United States despite the fact that robust stem cell therapies are being widely applied internationally to cure and control our most debilitating diseases. 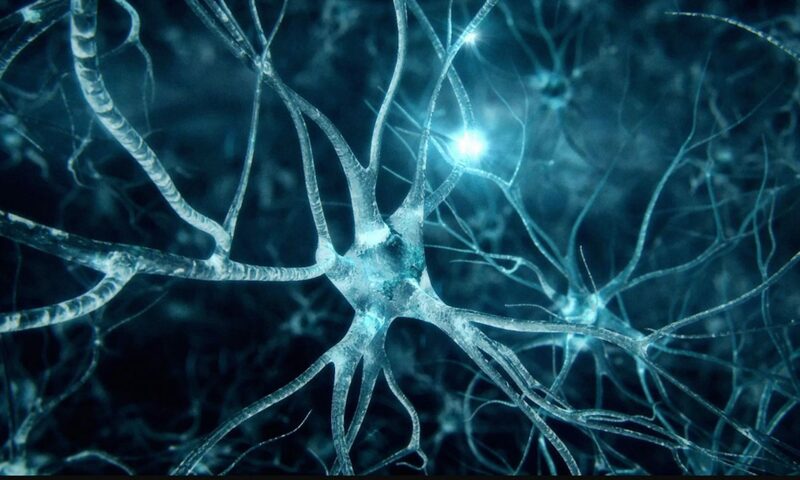 There are fine centers in Europe (Emcell, https://www.emcell.com/en/publications.htm), China (Beijing Puhua International Hospital (BPIH), http://puhuahospital.com/stem-cell-center/stem-cell-center ), Thailand (Regeneration Center of Thailand, https://stemcellthailand.org/treatments/ ), and Mexico where many US physicians treat their patients. The finest stem cell treatment center in the world is in Panama at the Stem Cell Institute-Panama (https://www.cellmedicine.com/ ). Why is the “finest center” not in the United States? We are not unmindful of, and certainly, applaud the few tiny steps being taken in the US by a handful of orthopedic physicians using stem cell fractions in conjunction with some orthopedic surgeries to enhance recovery and healing. So it is understandable that against this backdrop, America’s most gifted adult stem cell clinician, Kristin Comella, should be singled out for attack, criticism, and personal smearing in an effort to chill and silence her activities, if not outright ban them. A federal lawsuit was even filed against her to stop her treatment of patients and to slow the progress of adult stem cell therapy. This lawsuit followed closely on the heels of her blockbuster scientific report detailing the safety of adult stem cell therapy in 676 patients…the FIRST paper of its kind in the US. On peer review, this paper was not only passed without objection but was earmarked for immediate fast track publication in one of America’s most prestigious journals, the Journal of Clinical Medical Research. The Panama College of Cell Science is a foreign institution, a division of Blue Marble University, registered in the Commonwealth of Dominica. The College continues to offer the ONLY doctoral program in stem cell biology in the world that can be taken online. The College is directed by Walter P. Drake, a published scientist with over 30 publications in bio-medical peer-reviewed journals. 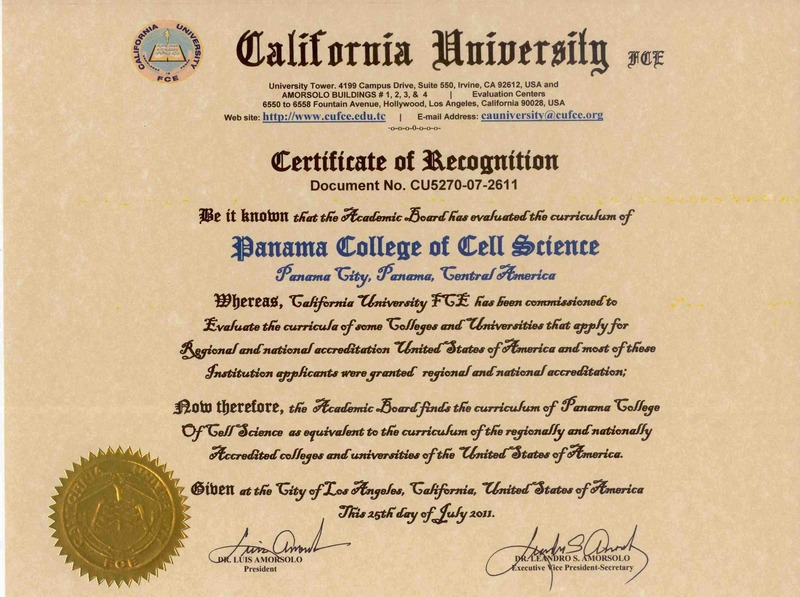 While not accredited in the US, where accreditation is not required whatsoever, the doctoral degrees issued by the Panama College of Cell Science are nonetheless equivalent to any doctoral degree issued by a regionally accredited US college or university. What does “equivalent” mean? It means that our program is the SAME as any other program in terms of credits, and educational requirements. This is determined not by us, but rather by various foreign education evaluators. Every one of our graduates who has sought a certificate of equivalency to use our PhD for employment in the US or anywhere else has obtained such upon graduation. Our program has even been pre-approved by the California University Foreign Credential Evaluation Service (CUFCE ) and the Certificate of Equivalency is shown below. When we sought review by CUFCE in 2011, the organization was on an approved list of foreign credential evaluators published by the United States Department of Education. The Department no longer maintains such a list, but now refers students to seek out a “professional foreign education evaluator” for such reviews. Nearly every foreign education credential evaluation service will find the same equivalency in our program. Dr. Comella’s previous additional education includes a completed doctoral program in Chemical Engineering at Ohio State University where she passed her Comprehensive Examination for a Ph.D. degree but left to pursue her own research prior to completing her thesis. To better put her training into perspective: Her graduate studies and course work at Ohio State University provided her the opportunity to work with Dr. Jeffery Chalmers to focus on the use of nano-particles magnets to isolate/separate cells. She then delved more deeply into stem cell research at Osiris Therapeutics — a small start-up in Maryland — and was mentored within a company founded by the ‘father of Mesenchymal Stem Cells,’ Dr. Arnie Caplan. Following her work at Osiris, Dr. Comella was offered the opportunity to work with Dr. Darwin Prockop, the Grandfather of cellular therapy research on mesenchymal progenitors, at Tulane University. We see an analogy in the similar attacks on Suzanne Somers. An actress with no scientific training, she exposed the criminal fraud perpetrated by Big Pharma and unknowing traditional doctors in treating women with hormone replacement therapy using synthetic drugs (that they called hormones) that exist nowhere in nature. She pioneered bio-identical hormone therapy for women. It took almost 15-20 years, but now, no woman will use other than cheap bio-identical hormones available either over the counter or through naturopathic physicians. She was vilified, smeared, laughed at, etc., but in the end, most women now recognize the fraud that the medical practitioners engaged in. She even changed the name for hormone replacement therapy, which used to be HRT, and now is Bio-identical hormone replacement therapy …BHRT. Which is to say, you don’t need any degrees to do good science. ”We are living in a historic time where we are witnessing the emergence of stem cell therapy as a rapidly growing modality that will soon become standard of care in modern medicine”. We hope that this “modern medicine” will not only be offered overseas!